Arthur W. Pink (1890-1953) launched his yearly publication, Studies in the Scriptures in 1921. These continued until his death, altogether 33 volumes of 288 pp. each. Most of Pink’s books are taken from these yearly books (written monthly in 24 page format). This title is one of the many taken from eight of those monthly magazines. Readers will find thorough consideration of all the facets of this Biblical Doctrine of Reconciliation. Pink covers: Its Arrangement; Its Need, Its Effectuation; Its Meaning; Its Scope; and Its Reception. There are Scriptures galore cited. Undoubtedly the reader will grow rich in knowledge and in the grace of Christ. The pages are full, with probably 400 words to a page, so buyers will get their moneys worth. 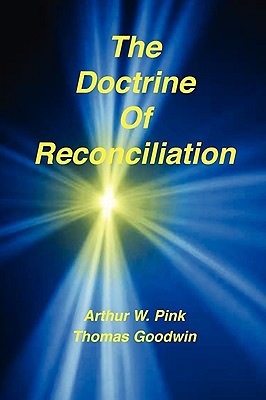 As an example of what a master workman like Pink does, note that he cites Romans 12:1, 2: [This verse] ''supplies an interpretation of the rites of the Law and of the reasonable part of the O. T. order of things. Thus, he who would make a covenant with God is required to give up himself wholly unto God with a sincere and firm resolution unto a new life of obedience to Him. If there is any reservation the covenant is marred in the making of it: ''Their heart was not right with Him, neither were they steadfast in His covenant'' (Ps. 78:37). Goodwin’s Reconciliation by the Blood of Christ is a sermon he preached on Colossians 1:20, in which He describes the seeming impossibility of reconciling totally depraved men to a holy God. Who is sufficient for such a task? He proves that only Christ Jesus had the fitness to fill this role of perfect obedience to the Law, together with an acceptable sacrifice to propitiate the wrath of God toward men. Pink was a Baptist Preacher in England, Australia, and the United States. He is most famous for his book The Sovereignty of God. But it was his now famous monthly magazine, Studies in the Scriptures which is the source of all his other books. Each book was written monthly, 24 pages at a time. Thomas Goodwin was one of the most famous of the seventeenth century Puritans. This sermon on Reconciliation is taken from the 12-volume set of the Nichols Series of Standard Divines, 1866, Volume V.